I have been an Alice in Chains fan since they first arrived on the music scene. I was in a band or two, and we did many a AIC cover song with me playing lead guitar and co-vocals namely in my grunge rock band, Rainmaker that attempted to take over the world in the early to mid-1990s. 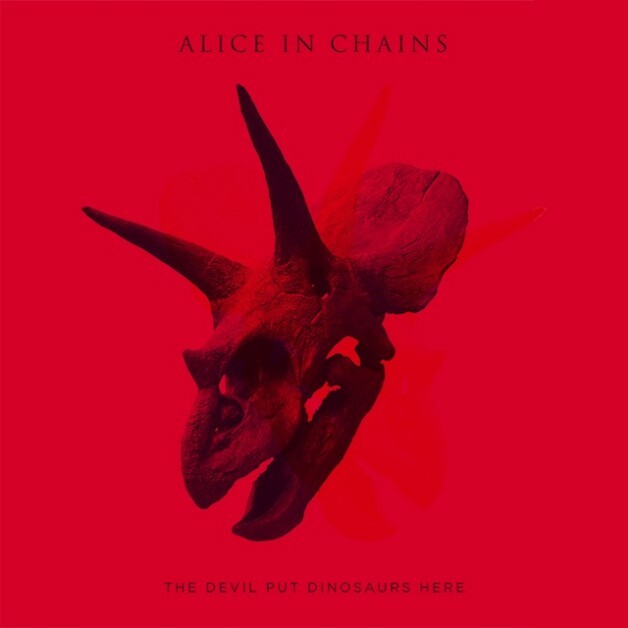 In their latest release, The Devil Put the Dinosaurs Here, it appears that AIC is still trying to find their own without Layne Staley. They tried in their first release in 2009 with Black Gives Way to Blue almost 8 years after Staley’s passing and they are attempting to do it again with Devil. They almost have it, but not quite. The album has really two main issues. First all the songs are a bit slow. True, AIC has released their fair share of slow songs over the years but in Devil they are overly abundant and all kind of sound the same. What happened to the days of pummeling riffs and expansive guitar textures that made the band a fan favorite not only in the Seattle grunge scene but all over the world. Songs like Them Bones, Man in the Box, and Grind? True, bands “grow up” and change things around a bit when members leave or pass away but AIC has done it a bit more than most on their latest release. Second is how the band continues to treat supposed frontman William DuVall. It is curious that the band would bring in DuVall as the lead singer and place him in promos as such when it is clearly Cantrell’s band. Cantrell’s co-vocals have always been a major part of AIC’s sound but since they brought in DuVall it is even more omni-present. DuVall sang a bit on Blue and it was understandable as to why. He had huge shoes to fill in taking over for Staley and they didn’t want to show any disrespect to their legions of fans. But if DuVall is going to be in the band, let him be IN the band. It is not that Duvall can’t sing. He does it well on the only track in which he takes the lead on Devil, Lab Monkey, but he just isn’t given the chance to prove himself. He has been in Alice in Chains now for seven years and it’s hard to believe that is as long as Layne Staley was in the band as well. If they are to continue they need to let DuVall develop his own personality and let it shine or will AIC become another band with a revolving door of vocalists? I hope not. With this all in mind, Devil is still a pretty good album. I would be wrong to say that the best days of AIC are behind them. They still have what it takes to rock with Cantrell or DuVall in lead behind the mic. They just have to make up their mind as to what is best for them. Because we all know that no-one can replace the unique sound of Staley and if they try AIC will become a thing of the past.